150 15-04-2019 Re-constitution of the House “Committee on Privileges” and “Committee on Petitions” for the year 2019-2020. 147 14-03-2019 Nomination of the Chairperson for the Committee on Public Accounts, Committee on Government Undertakings and Committee on Estimates. 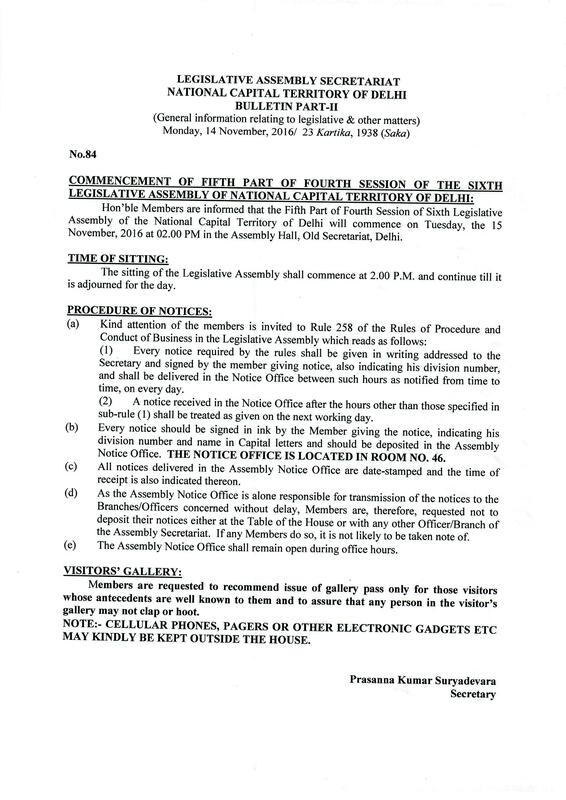 144 06-02-2019 Commencement of Eighth Session of the Sixth Legislative Assembly of NCT of Delhi. 143 24-01-2019 Election of three Members to the State Advisory Board under the provisions of the Rights of Persons with Disabilities Act, 2016 (Result). 142 23-01-2019 Election of three Members to the State Advisory Board under the provisions of the Rights of Persons with Disabilities Act, 2016. 141 16-01-2019 “MLA” Parking Label for the year 2019 for entry of vehicles of MLAs in the Assembly Complex. 140 15-01-2019 Election of three Members to the State Advisory Board under the provisions of the Rights of Persons with Disabilities Act, 2016. 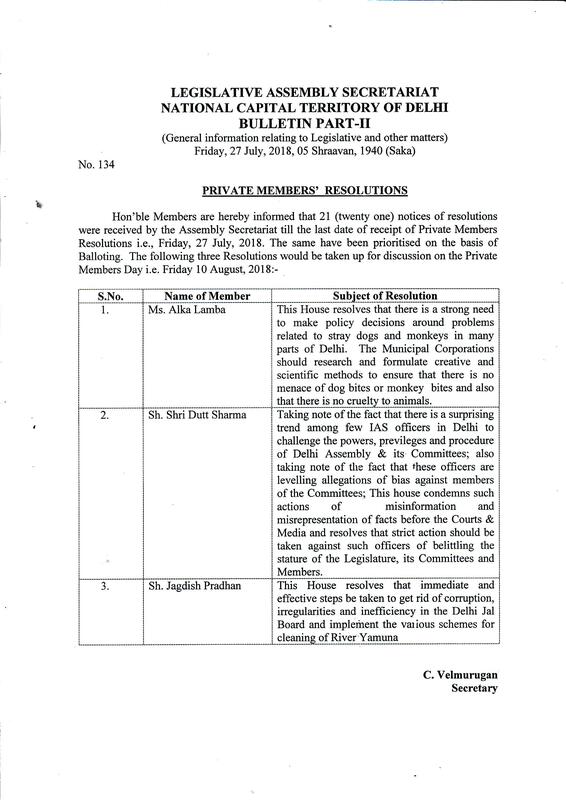 135 23-08-2018 Nomination of Sh Adarsh Shastri as member of the "House Committee on violation of Protocol Norms and Contemptuous Behavior by Govt. Officers with MLAs"
85 03-01-2017 “MLA” Parking Labels for the year 2017 for entry of vehicles of MLAs in the Assembly Complex. 50 31-03-2016 Nomination of the Chaipersons of the Comittee on Govt. Undertakings, Committee on Public Accounts, and Committee on Estimates. 47 14-03-2016 Guidelines for issue of Casual entry pass and vehicle Pass for entry in the Assembly Complex. 35 06-11-2015 Corrigendum regarding Notices for Questions relating to Women and Child Development Department. 28 20-08-2015 Orientation programme for Hon'ble Members. 27 14-08-2015 Adhoc Committee on "Problems relating to Jhuggi Jhopri & Slum clusters in NCT of Delhi." 26 13-08-2015 Orientation Programme for Hon'ble MLAs.